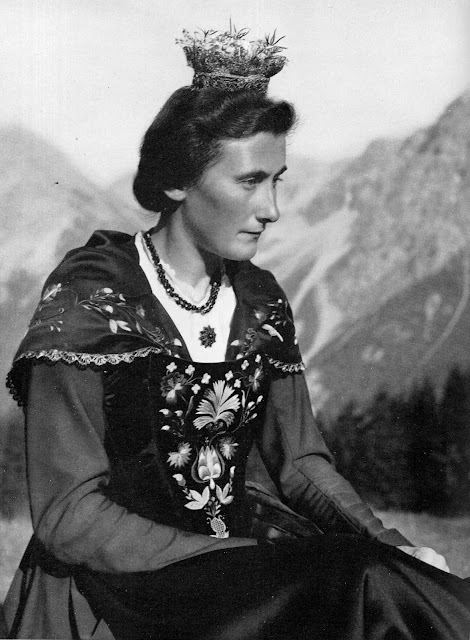 Continuing my series of articles on the minority peoples of Europe, today I am going to do an overview of the folk costumes of the Rhaetian Peoples. 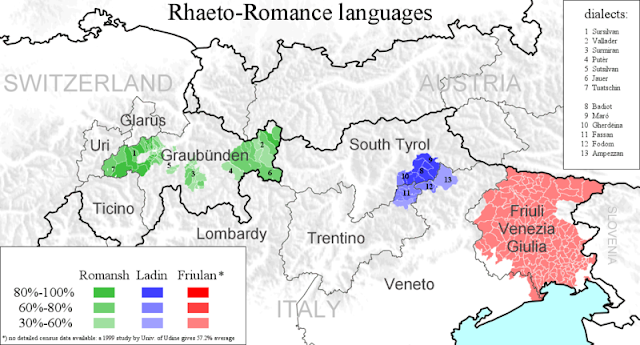 The Rhaetio-Romance languages were spoken throughout the southeastern Alps in the middle ages. Since then the various dialects have been in retreat from German in the north, and Italian [Venetian and Lombard] from the south. 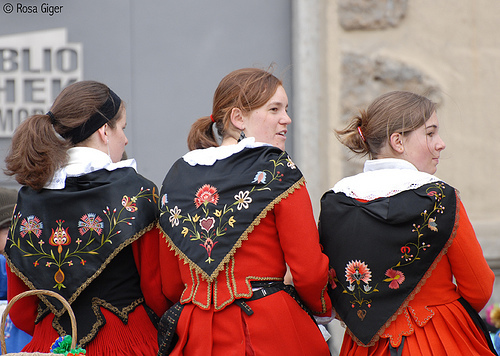 Today the extant dialects are generally grouped into three languages, Romansh in Switzerland, Ladin and Friuli in Northeastern Italy. Here is a map showing the current extent of these languages. I will do an article on each of these three. 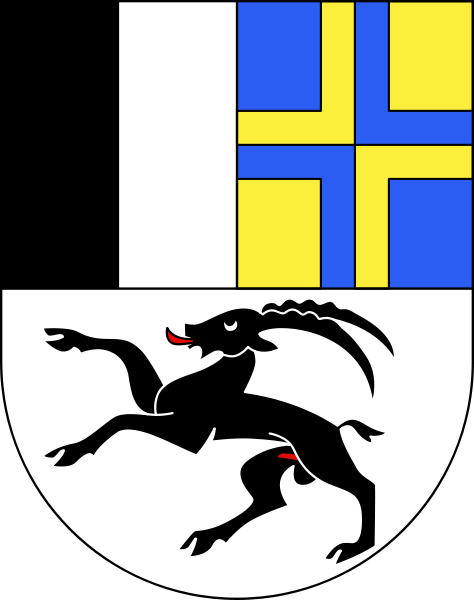 Throughout this region, places tend to have at least three names, in Italian, in German, and in the local dialect. I will try to provide all three, I hope it will not get tiresome. The costumes of the three peoples do not have much in common. 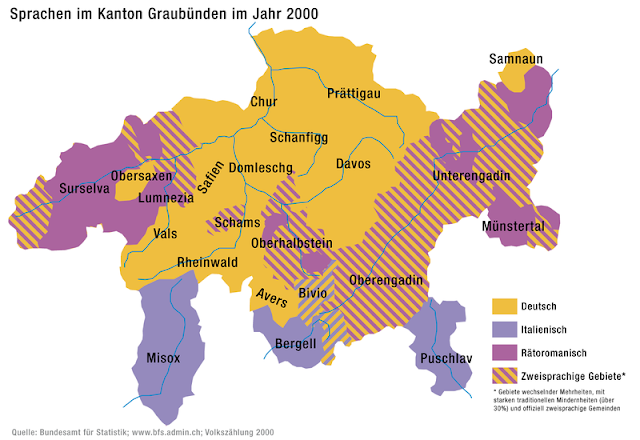 This is one of the four National Languages in Switzerland, but currently is only spoken in the canton of Graubünden [German], Grisons [French], Grigioni [Italian], or Grischun [Romansh]. It was formerly spoken over a much wider area, as far as Lake Constance in the north, and was spoken in Vinschgau in South Tyrol until the 17th cent. 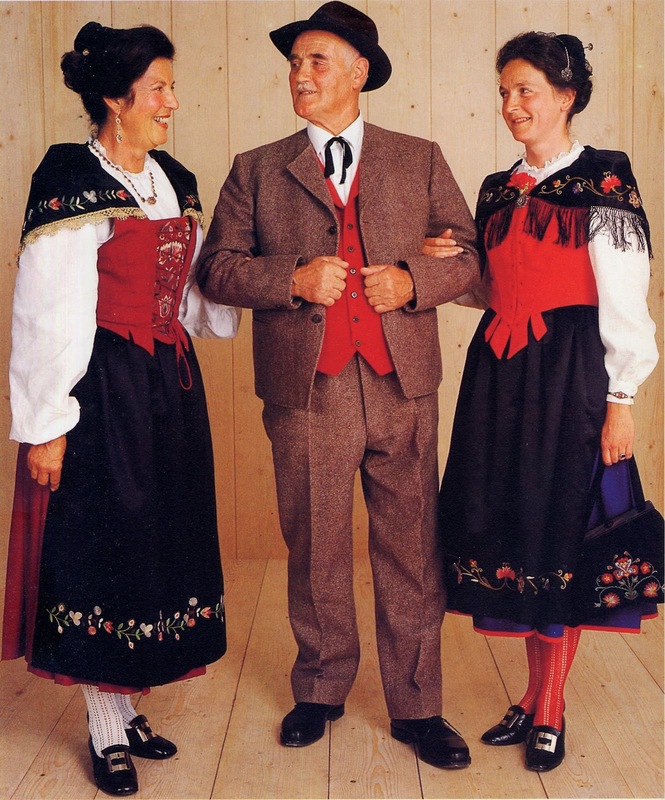 As is the case with many minority languages, several distinct dialects are spoken, a Literary standard exists, but is not popular, the people who speak Romansh tend to be devoted the the speech of their particular area, again, as is typical for speakers of minority languages. Here is a map of the current distribution of native languages in Grischun. For those who are interested, here is an article on the Romansh language in Romansh. As you can see, the various dialects are no longer contiguous. The costume of Grisons is quite similar over the entire area, with minor variations. 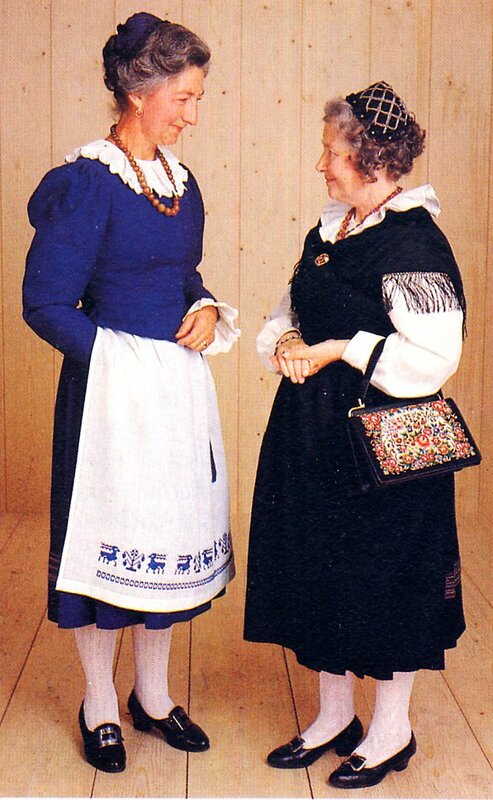 The only exceptions are the costumes of the Italian speaking areas in the south. 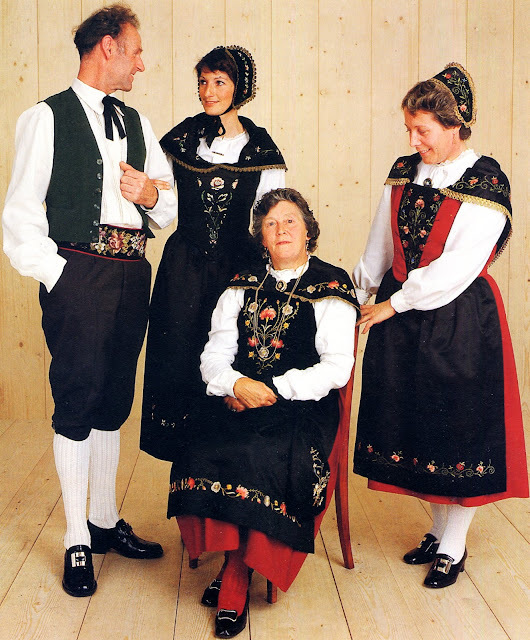 There is no sharp distinction between the costumes of the German [Allemanic] speaking areas and the Romansh speaking areas, as formerly the entire area spoke Romansh. 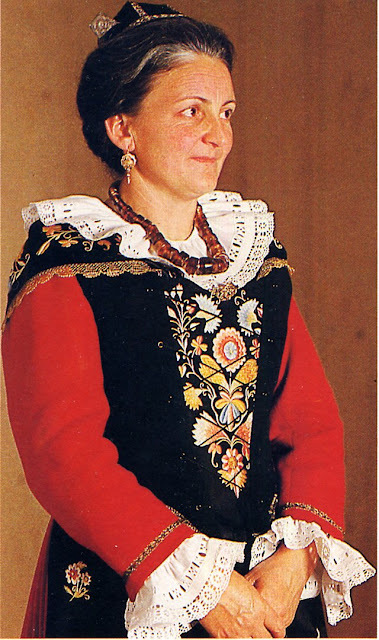 Elaborate graceful embroidery is worked on the apron, shoulder shawl, and often the plastron over the entire region. Jackets are smock-gathered on the upper sleeve. 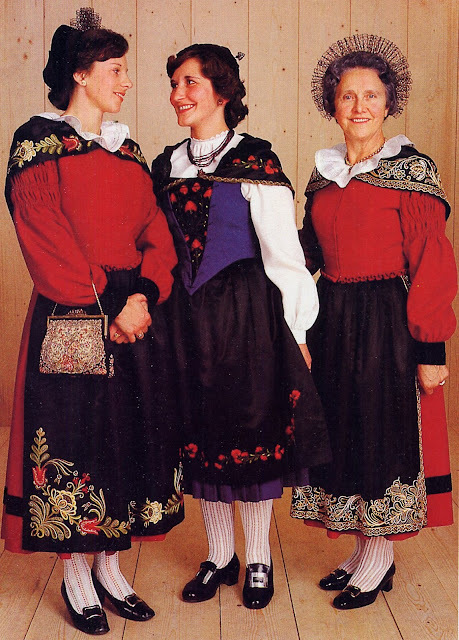 These are known as Spencers and are common throughout the Alpine region. 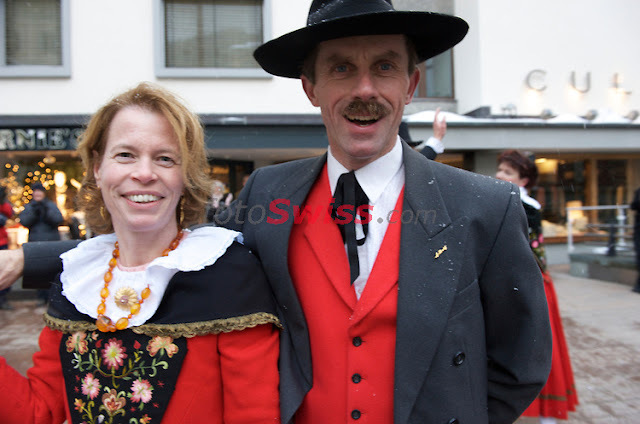 Surselva is the region around the headwaters of the Rhine River and forms the largest remaining Romansh speaking community. Schams / Val Schons is an island of Romansh surrounded mostly by Allemanic speakers. The tiny bridal crown is supplemented with myrtle leaves, and is also found in other parts of the Canton. 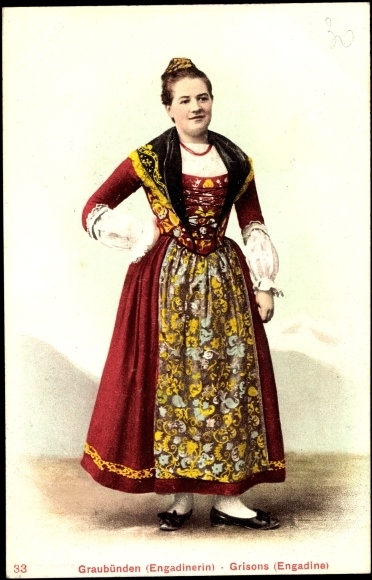 The costume of Herrshaft / Signuradi, on the lower reaches of the Rhine, downstream from Chur / Cuira. This and the following regions have only a small percentage of Romansh speakers. Schanfigg / Scanvetg left, and Prättigau / Partenz, right. 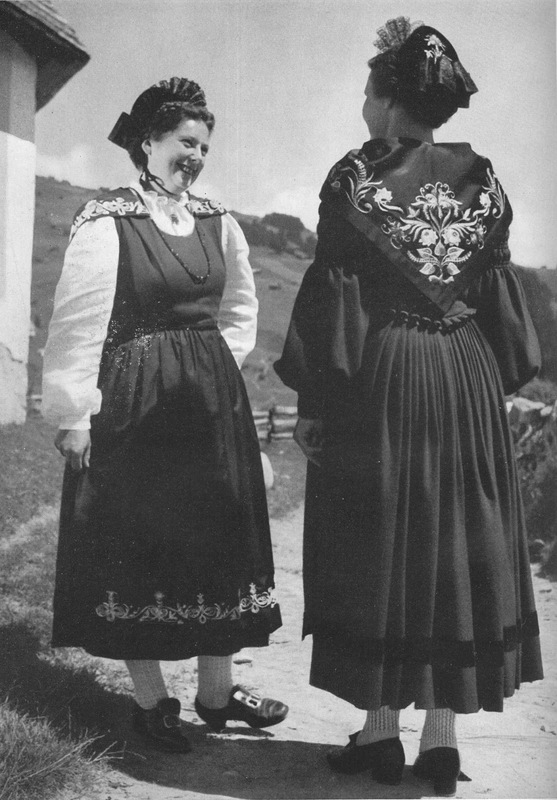 Rear view of the Prättigau / Partenz costume. 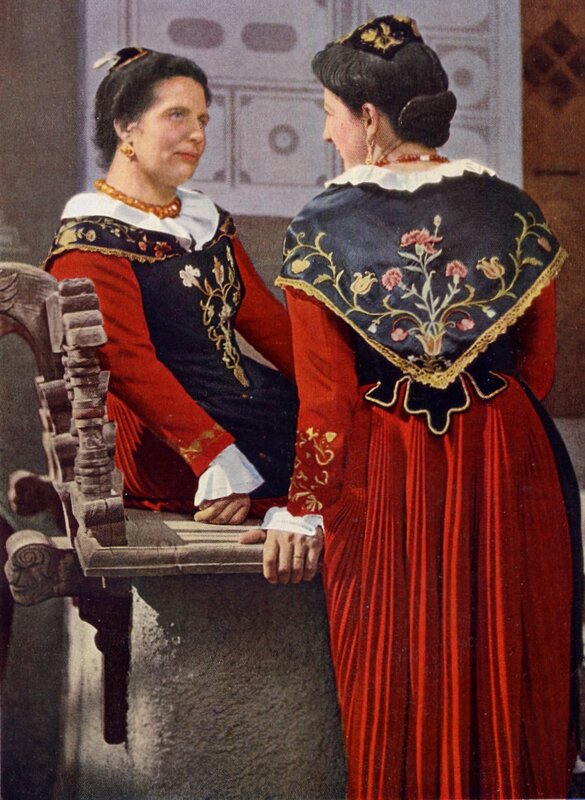 Albulatal / Val d'Alvra costume on the seated woman. This is found between the Davos and Oberhalbstein regions on the map above. 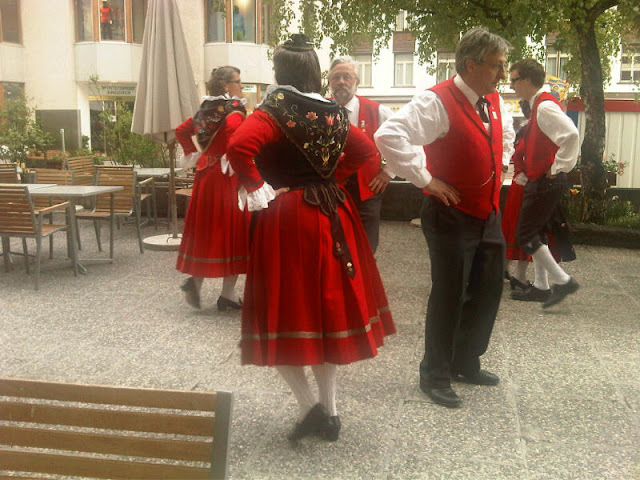 The standing figures are wearing the costume of the neighboring Oberhalbstein / Surses valley. This has a larger proportion of Romansh speakers. 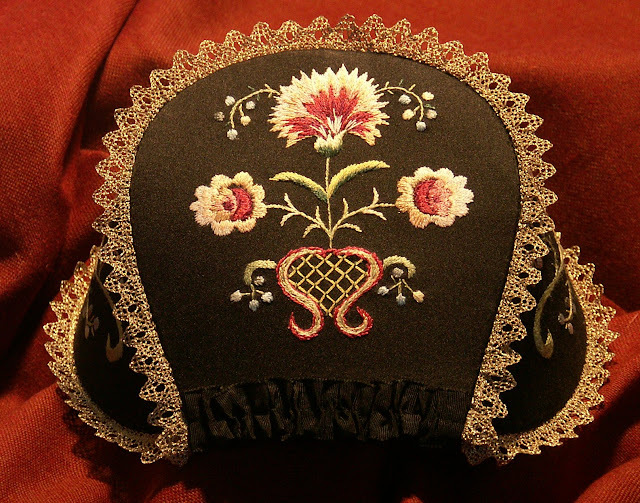 A couple closeups of the embroidered cap, [biretta] of Oberhalbstein / Surses. This is typical of the satin-stitch embroidery of the Canton. The most famous variant of this costume is that of the Engadin / Engiadina valley. This is the upper headwaters of the river Inn, in Romansh, En. This is the best known and likely the most elaborate variant of this costume. 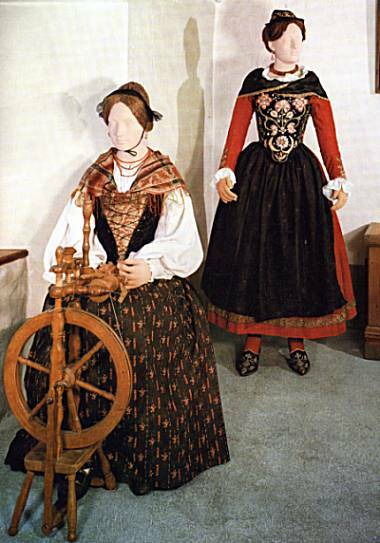 Older forms of the costume had a long pleated skirt, More recently the tendency has been to shorten the skirt and simply gather it. 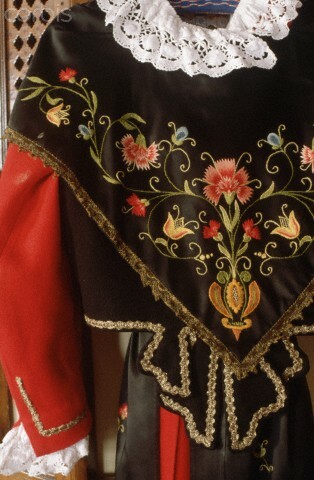 The wide lay-down lace collar and cuffs are one distinctive feature of this costume. The Lower Engadine costume has more black than red. 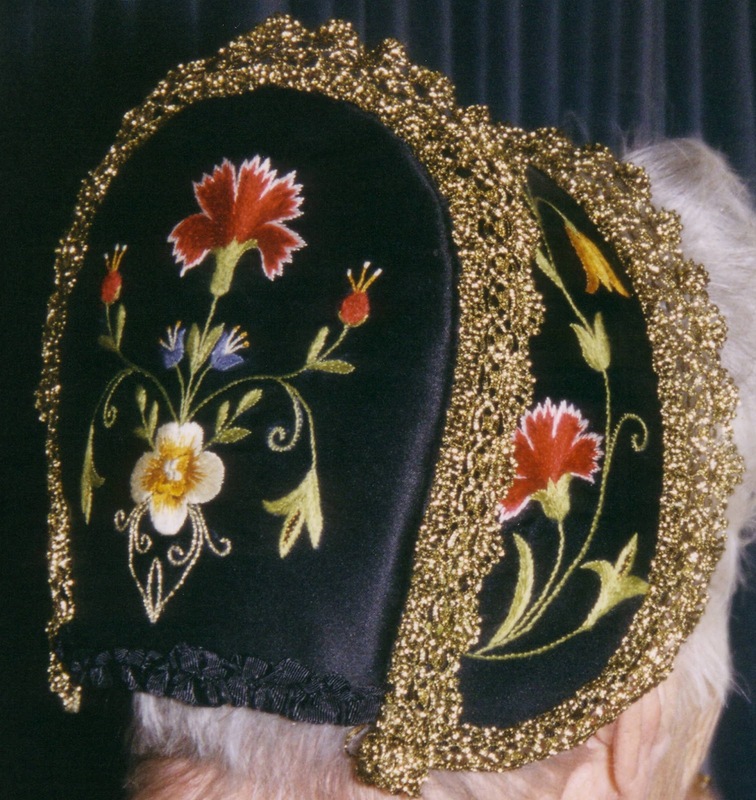 This is an older widow, who has completely done away with the embroidery. 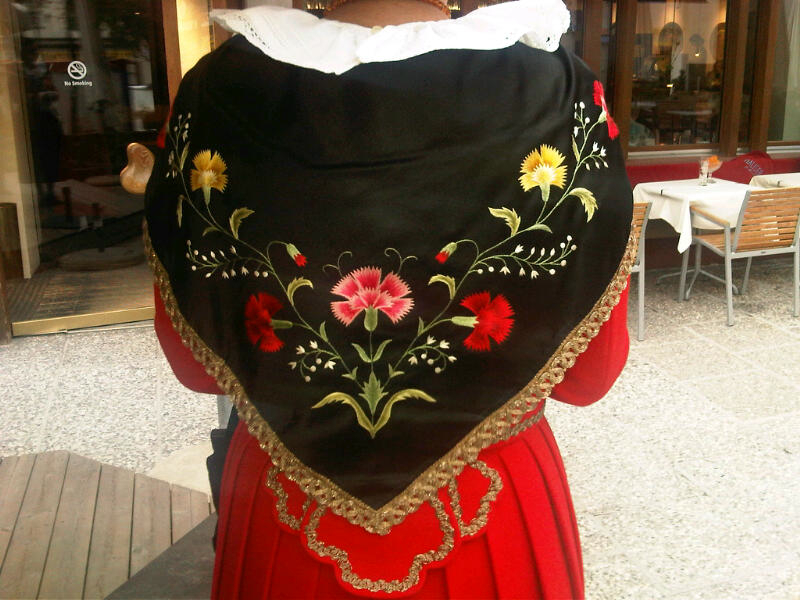 Some examples of the shawl embroidery on the upper Engadin Costume. A dance group from the upper Engadin. There is one more costume which is a fairly recent innovation, a simplified everyday going-out costume which is meant to represent the Canton as a whole. 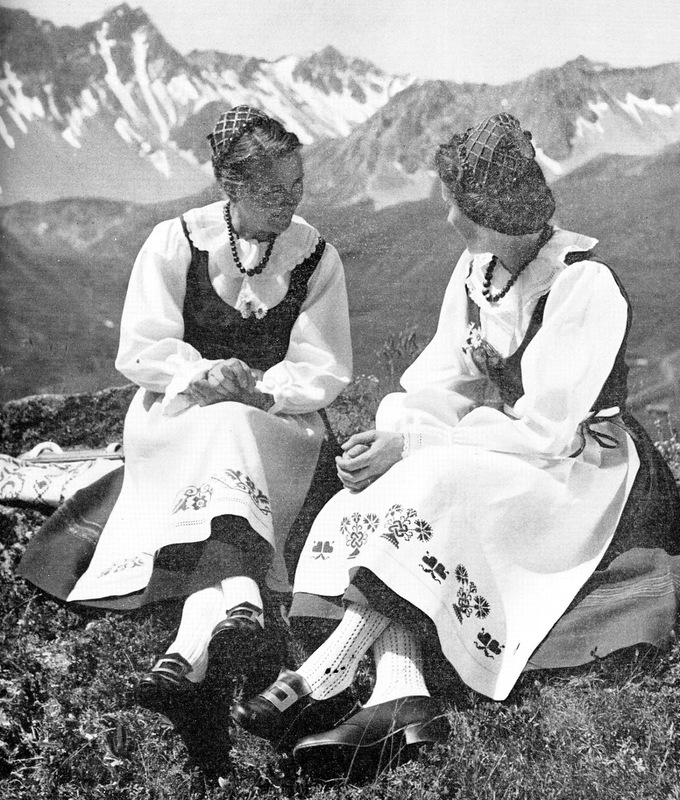 The linen version of the apron features the cross-stitch embroidery which is a strong tradition on household linens in this region. It may be done in black, blue, red, or a combination of red/blue or red/black. A couple of prints of Grischun Costumes. 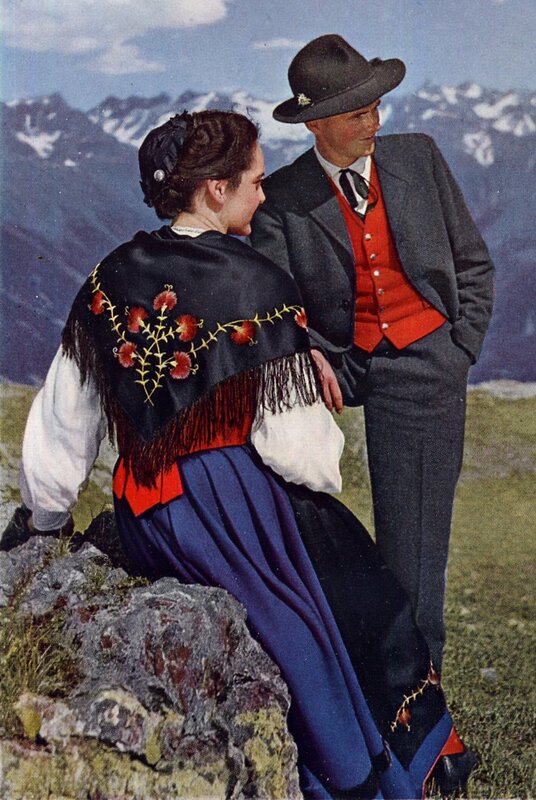 A video in Romansh explaining the Engadin Costume, The cameraman has the unfortunate habit of excessive closeups that hide more than they show, and I don't know why the opening sequence is so dark, but still worth watching. Thank you for reading, I hope that you have found this interesting and inspiring. 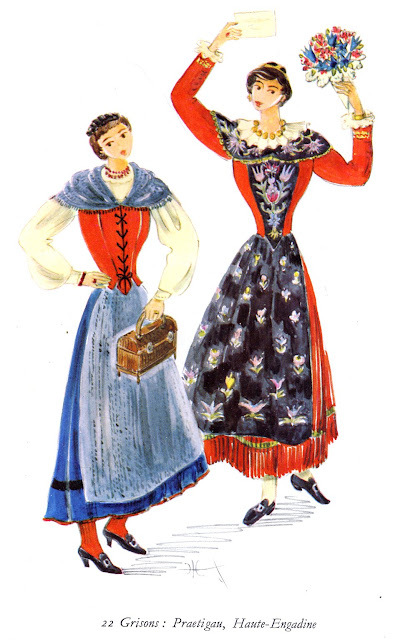 The embroidery of this costume could be adapted for any number of interesting projects of your own around the house. Feel free to contact me with requests for research. I hope to eventually cover all of Europe and the Former Russian Empire/Soviet Union. I also gratefully accept tips on source materials which i may not have. 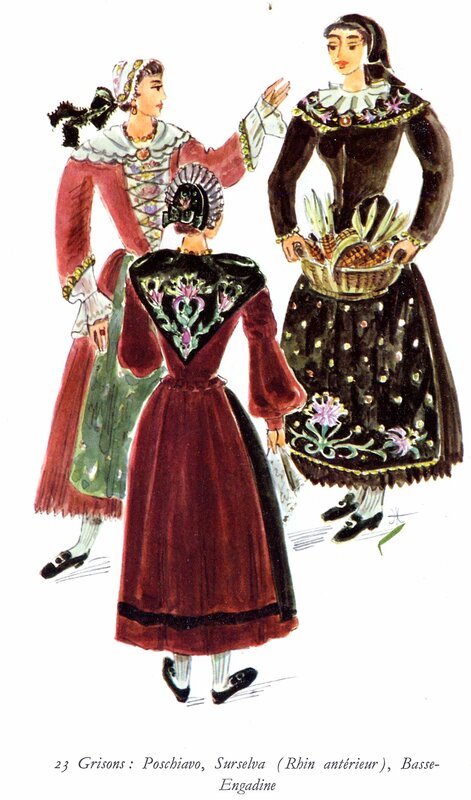 I also accept commissions to research/design, sew, and/or embroider costumes or other items for groups or individuals. 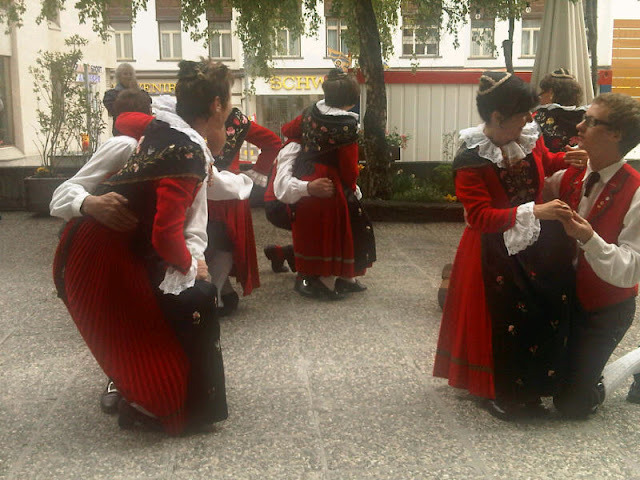 I also choreograph and teach folk dance. As always a very interesting article. The embroideries are wonderful, I imagine the time spent on doing these. I love your blog,thank you.